In Ed van der Elsken Archives, Annet Gelink Gallery proudly presents Color & Motion. Esteemed cinematographer Robby Müller and his wife Andrea were approached to make a selection of works from Ed van der Elsken's archive to form a show; however, the project quickly evolved into a meeting between Robby Müller's Polaroids and mostly early work by Van de Elsken. Presenting never before exhibited works by Müller as intriguiging prints of Polaroid and lesser-known photographs by Van der Elsken, Color & Motion explores the many faceted relationship between light, camera and photographer. What does their photographic eye register when they travel round the world, camera to hand, or when they experiment in private settings? Having worked with Wim Wenders, Lars von Trier, Jim Jarmusch and Steve McQueen amongst others, Müller is widely acclaimed for his distinctive style and philosophical approach. Rather than relying on the possibilities offered by technology, Müller's starting point was always the story being told and the emotions involved. His work, on films such as Paris, Texas andDown by Law, has been praised for complementing and shaping narratives through light, color and camera angles. 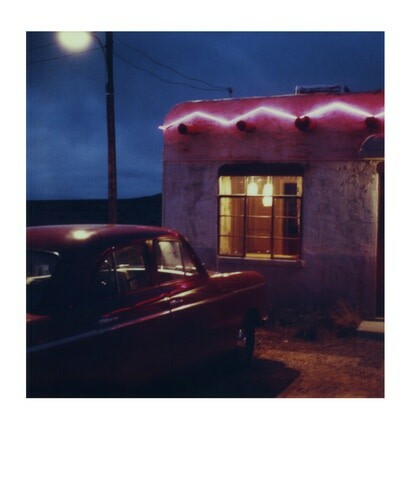 Müller would often take Polaroids in moments in between his work on set, as studies in light and composition. As such, they mainly document his hotel rooms or the abstract patterns in urban landscapes he came upon during his walks through foreign cities. He would seek out lines in the typical square Polaroid format and find movement in light through the interplay of reflection and shadow. Müller also often photographed complex situation, such as the 'blue hour' where artificial and natural light meet. There is a clear line to be drawn therefore between the Polaroids and the films Müller made, with Mülller here establishing painterly tableaus through the instant medium of Polaroid. These stilled moments and compositions display the working mind and eye of Müller. The selection from Van der Elsken's oeuvre show Van der Elsken's lesser-known works. The photographs on view can also be seen as experiments; we see Van der Elsken exploring the possibilities of capturing movement or a particular atmosphere, or documenting the world around him in color. While the early black and white photographs tend towards abstraction, his color photographs possess a to us unknown array of color from a by-gone era. Color & Motion can be seen as a dialogue between the two individuals, who each in their own way have become known for using light and film to capture and present the world around us. The showpresents the visual back and forth between the two, on questions of light, motion, angle and color. Moreover, in true Müllerian style the exhibition argues that personal vision directs technological ability.